Introducing 4K recording plus 120 fps Full HD slow-motion capture to the Action Cam line is theFDR-X1000V from Sony. 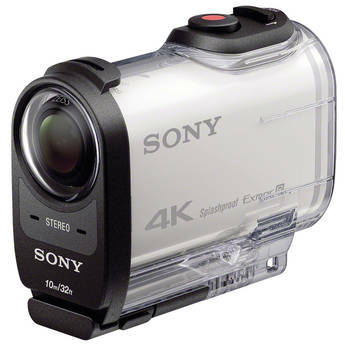 This versatile, splash resistant camcorder is designed to go wherever you do - whether on a mountain expedition or just for a walk in the park. Featuring Wi-Fi, the camera can be operated remotely using a mobile device or with the separately available RMLVR2 Live-View Remote. It features a water-resistant design and simple one-button operation. Video is recorded to a separately available microSD card, with the option for web-friendly MP4 and professional XAVC S compression. Apart from being splash proof, the camera includes a 33'-rated underwater housing, an adhesive mount, and one battery to get you started. Further extending its potential, there is a plethora of separately available mounts and accessories, enabling you to wear the camera or helmet mount it for POV action shots, attach it to a bike or vehicle, secure it in a static location, adhere it to a board or boat, or even see the world from the perspective of your pet. Order now for just $498!